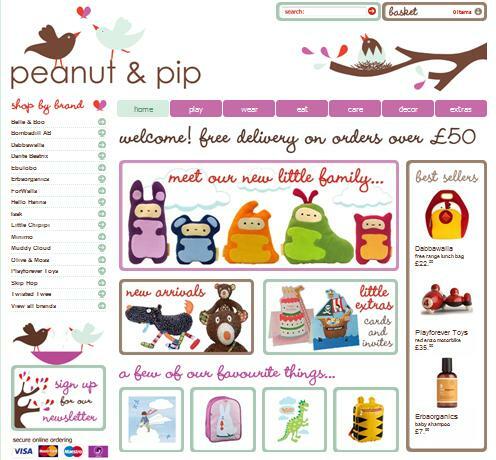 Hot new shop on the block Peanut & Pip opened its virtual doors this morning. This brand new store aims to provide a constantly changing range of scrumptious new products. Owner Becky says that she is completely addicted to sourcing new products and will always bring you fresh, exciting brands. The opening collection does not disappoint. With site design by Isak and an array of products which could keep us in posts for days you are in for a treat. You will find Bambino favourites like: Dante Beatrix, Isak, Olive & Moss and Skip Hop as well as some sizzling new brands such as Dabbawalla, Muddy Cloud and Ebulobo. We will be featuring some of our new favourites in the next week. Discovered byÂ Sara of Sprout Photography (who probably deserve a post of their own – check out their gorgeousÂ baby and childÂ photography! ).